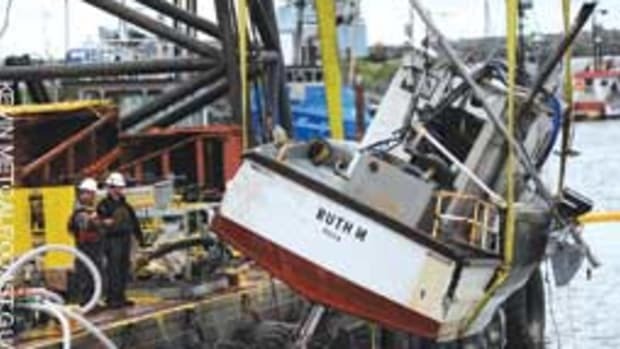 Contractors begin the process of righting a beached 65-foot commercial fishing vessel Jan. 4 at Francis State Beach on California&apos;s Half Moon Bay. Coast Guard Sector San Francisco pollution investigators monitored the situation to prevent any environmental problems. 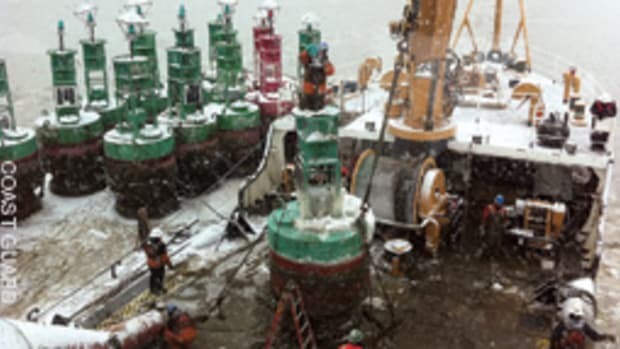 A Coast Guard crew and local first responders worked together to rescue an injured tugboat crewmember near Kingston, N.Y.
An engineer aboard the tug Barbara McAllister reportedly suffered a leg injury and was stuck in the engine room while en route to Albany, N.Y., via the Hudson River. Coast Guard Sector New York&apos;s search command center dispatched the cutter Wire to Kingston, where the crew took on members of the Kingston Fire Department and Emergency Medical Services to assist in the rescue. 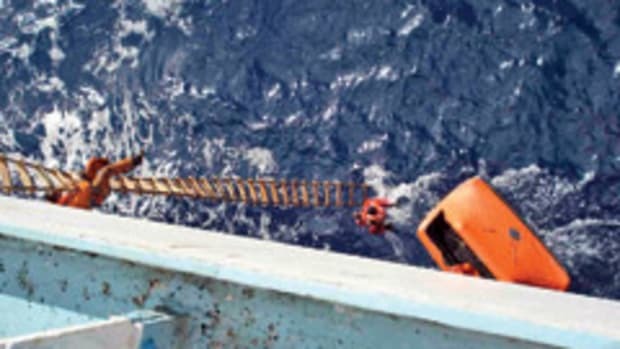 The Coast Guard sent a cutter and a rescue helicopter crew to assist a disabled fishing boat about 50 miles south of Shinnecock, N.Y. The fishing boat Neskone, with eight people aboard, contacted Coast Guard Sector Long Island Sound at 4:30 p.m. Dec. 20, reporting mechanical difficulties that caused the boat to become disabled and adrift at sea. A sister fishing boat, the Polaris, made an early morning attempt to rendezvous with the Neskone and take the disabled boat into tow. Polaris arrived at the scene at about 2 a.m., but was unable to establish a tow because of rough weather. A Coast Guard helicopter crew dropped off needed mechanical parts. The crew of the Coast Guard cutter Harriet Lane arrived at the scene at 3:30 p.m. with plans to establish a tow and bring the disabled fishing boat to New Bedford, Mass. Coast Guard Sector Long Island Sound is emphasizing a campaign that encourages kayakers and canoeists to label their boats, paddles and safety gear with their names and contact information. This helps the Coast Guard determine whether gear was accidentally lost or whether someone is in real danger when it is found adrift. "If there is a chance that someone is out there and in danger, we&apos;re launching. We want Coast Guard eyes on scene. We&apos;re going to figure out what happened and look for people in the water. Unfortunately, this means that we often spend a lot of time searching the water for people who are safe at home. If we are able to contact the owner and verify the vessel was not in use when we found it, the case can be avoided completely, conserving our search and rescue assets," says Petty Officer First Class Anthony Kozak, a search-and-rescue controller in the command center at Sector Long Island Sound. The sector launched a search for a person in the water when an empty kayak was found adrift Dec. 22. It cost about $400 to conduct the hourlong search in a small boat. Longer searches with multiple surface and air assets drive up costs and take away search-and-rescue assets for real emergencies. Sector Long Island Sound responded to 53 cases in 2009 in which recreational boats and kayaks were found empty and adrift. Clearly labeling all paddle equipment with identifying information could prevent searches for people who are not in danger and, in the case of a real emergency, can provide important information that the Coast Guard can use in its search. The Coast Guard Auxiliary provides free identification stickers, which are available at all safe boating classes and events at which the Coast Guard Auxiliary is participating. Permanent markers and paint also can be used to label paddle boats and equipment; multiple contact numbers are encouraged. For the recreational boating community on the upper Hudson River, boating safety is making progress because of good practices, the Coast Guard says. 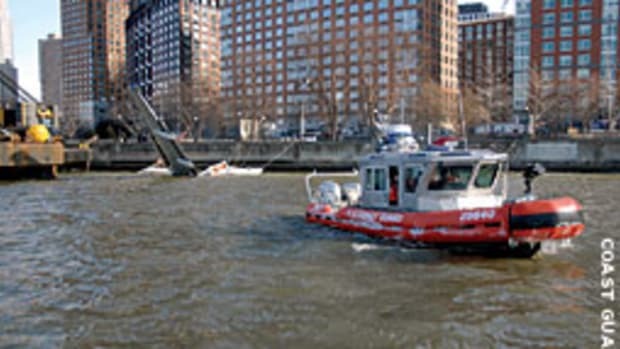 A recreational boater was killed in 2008 and 2009 in accidents on the upper Hudson River. In 2010, there were no fatalities among recreational boaters on the upper Hudson, which the Coast Guard says is no accident. "People are boating more safely and the stats say so," says Coast Guard Lt. j.g. 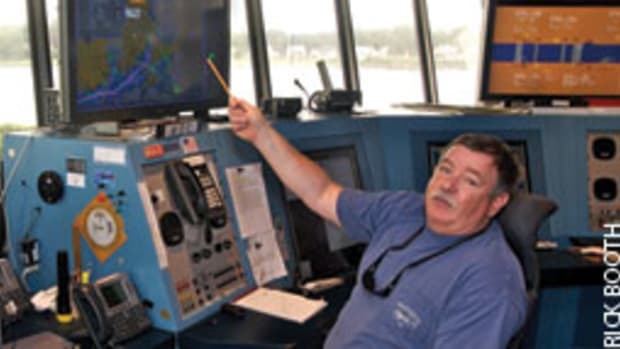 Dave Ruhlig, project officer for Operation Sail Safe, a concerted effort by the Coast Guard and cooperating agencies in New York to make recreational boating safer. Launched in May 2010, Sail Safe was a sustained, multiagency operation with the goal of saving lives. 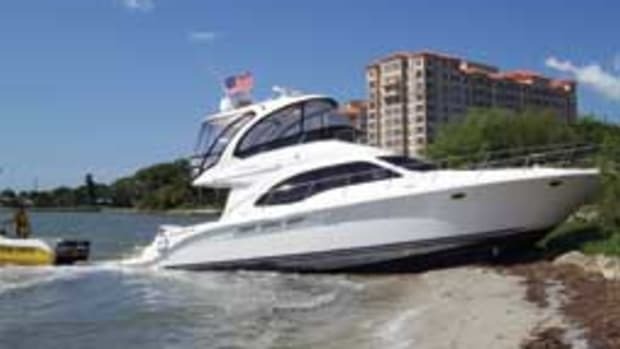 The principal means of enforcement was boardings of recreational vessels by legally empowered teams from the Coast Guard and state and local law enforcement agencies. "Many boaters see these boardings as anything from an unpleasant interruption of their day to heavy-handed harassment by the Coast Guard and law enforcement," says Lt. Cmdr. Michael Batchelder, head of the law enforcement branch of Coast Guard Sector New York, the command charged with maritime safety and security on the upper Hudson. "They are anything but - we&apos;re out there to prevent tragedy." Batchelder sees the progress in boating safety as being the direct result of sustained and focused law enforcement and of recreational boaters understanding the message. "For the last few years, we have targeted the upper Hudson with a focused campaign of enforcement of safe boating laws," Batchelder says. "Those efforts have paid off. I see definite indications of greater public awareness and compliance with regulations." The numbers seem to bear him out. Besides the lives that weren&apos;t lost, fewer owners had their voyages terminated because of unsafe conditions, such as structurally unsound or grossly overloaded boats. In 2009 there were 37 vessel terminations. There were only 12 in 2010. Lesser violations - those that require correction, but do not necessitate voyage termination -also are on the wane. In 2009, 263 violation notices were issued; in 2010, there were only 75. These improvements are welcome, but not an excuse for complacency. 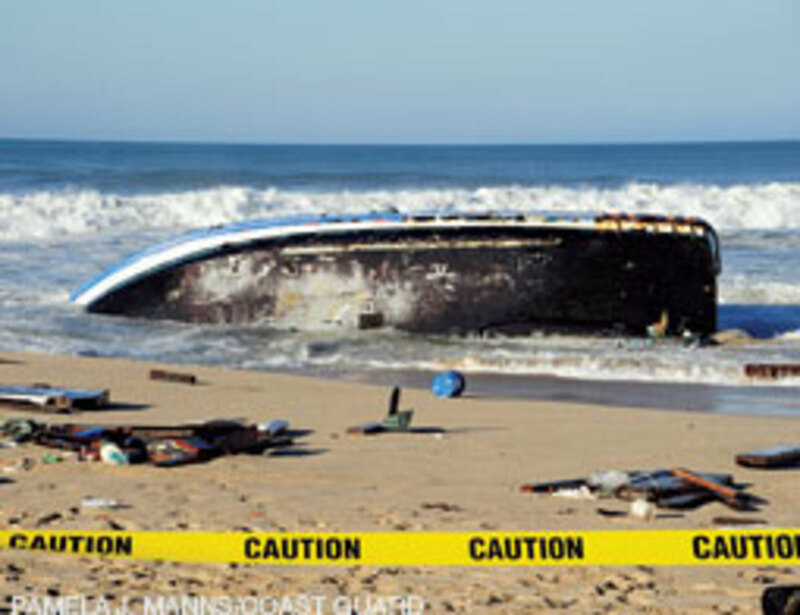 In 2009, 4,730 accidents were recorded by the Coast Guard nationwide. There were 736 deaths, more than 3,300 injuries and about $36 million in property damage. The accidents and deaths point to a combination of factors: operator inattention and inexperience, excessive speed, improper lookout and alcohol consumption. Alcohol was the leading factor in 16 percent of deaths. 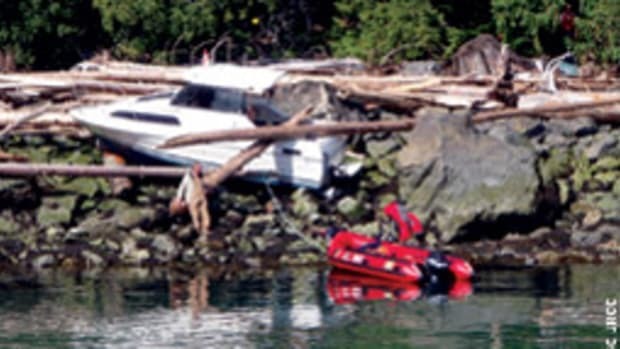 Eighty-six percent of boat operators in fatal accidents had not received safety instruction. Nearly 75 percent of the 736 people who died in boating accidents in 2009 drowned; 84 percent of those victims reportedly were not wearing a life jacket. This article originally appeared in the Connecticut and New York Home Waters Section of the March 2011 issue.